I saw this most amazing top in Zara week before last and I had to try and make it. It’s so simple, and making the pattern wasn’t too arduous either? I don’t like making patterns. I have made too many mistakes in the past. It’s cheaper and easier to just buy them. A word on fabric. Usually you need to be careful with your fabric choice as the weight and density will affect the fit. 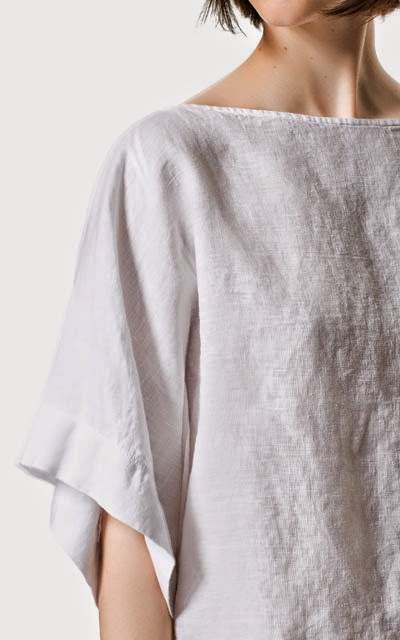 I made this top in muslin but I suspect, and will be trying, that you can use heavier fabrics. This pattern lends itself to the sheer loose summer tops that are hot right now. Trace a chunky T shape around your top. See the pic for guidance. Also remember to allow a 1.5 centimetre seam allowance around the outside of your pattern. You need two matching pieces, a front and a back, so fold the fabric in half before you cut. Pin your new pattern to your fabric and cut out your top. I never edge stitch unless I am using fabric like satin, but this is the time to edge stitch if you fear the edges will fray. Start by sewing the sides and underarms together on both sides. Next, pin the top side of the sleeves and allow a space in the middle for your head to fit. See the pic for guidance. Now, you need to sew a hem in the neck area, the edges of the sleeves and on the lower edge of the garment. Before you do that, try it on to make sure you are happy with the fit and check how long you want the top to be. Finish hems and then iron. finish, or even wear it inside out for an even more rustic take. See another version of this top made from old curtains – DIY Kimono top. And that’s it! Thanks Zara for the inspiration. Plenty more ideas like this one on the Greenie Galleries. Find them at the top of this page. I’m sorry Holly. There is definitley a pcture of the top. Great tutorial! Can I use chiffon?? Not sure to be honest. Chiffon is not easy to work with. It frays a lot. Sorry I can’t be more helpful than that. There is no curve in the neck on this top. But I would suggest adding a slight curve as it sits high on the neck. Thank you very much for your kindly. I am so excited to try this! I am going to make matching tops for my girls and me! Glad to hear. Super easy pattern. Loved this easy to make top. Perfect for staying cool on a hot day! I didn’t finish the sleeve edges or the bottom because my fabric has a natural fringe and it really looks great. So pleased to hear Beth. LOVE the idea of a raw hem. We have a few fabric shops in Woodstock, here in Cape Town, South Africa. I usually shop there. The mannequin I found on Gumtree. I guess it’s a similar site to Craiglist. I must say, she’s a weird shape. Her hips are tiny. Her bust is huge and high on her chest. Her head is enormous and her hands minuscule. Would love a more realstic model, but I’ve gotten used to this one. I love the higher neck! I’m getting ready to rock into my 6th decade and trust me…nothing ages pretty! I am also going to make this knee length for a linen summer dress. It will be ready for the weekend! Let me know how it goes with a longer length Cynthia. You can post a pic on the Greenie Facebook page. Just discovered your site. I ditto Cynthia above. Think I’ll try this pattern. Your instructions read ‘for the simple seamstress’: no waist, no sleeves to fit, no zip…Perfect. Love the wide hem on the sleeves! I have some linen and flour sack cloth that would work well for this. Thx for sharing this idea with us. Such an easy way of making a top.